As more schools move toward inclusion, how can general and special educators work together to create warm, welcoming classrooms where all students learn and belong? Discover practical answers in this friendly, down-to-earth teacher's guide. 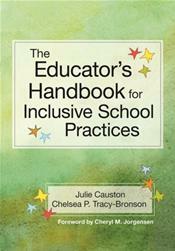 Filled with ready-to-use teaching tips, insights from inclusive educators, and examples that relate directly to everyday classroom experiences, this book will help general and special educators collaborate effectively and build a great "toolbox" of strategies to support all learners within inclusive classrooms. With this highly motivating guidebook close at hand, new and seasoned educators will create engaging, exciting, and joyful inclusive classrooms that support social and academic success for all.